The plant sale that benefits the Wild Gardens of Acadia has a long tradition. Soon after the 1961 founding of the Gardens, the plant sale (actually sales, as there were both a spring and a fall sale) became a way of raising funds to cover inevitable garden expenses. 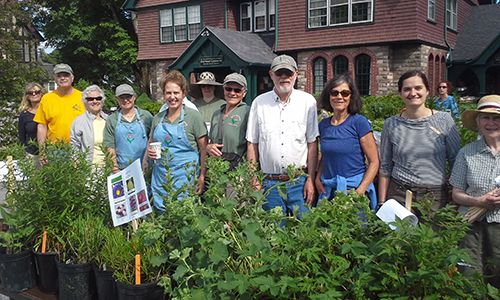 That era was a time of few nurseries in the MDI area–hard to believe now–and the Wild Gardens’ core of volunteers simply dug and divided perennials from their own gardens for the sale. The plant sales were small and cozy affairs, as much for the camaraderie as they were for the bottom line. Over the years, the sale has grown! The diversity and number of plants offered are due to the generosity of several Mount Desert Island estates, the Land and Garden Preserve, and many local nurseries. Miller Gardens (founded in 1927), was one of our earliest friends. Fernwood (now in Montville, featuring natives and shade plants) was another. Other stalwart supporters including A.C. Parsons Landscaping, Ann Smith, Atlantic Landscape Construction, Chris’s Farm Stand (Tremont), Dublin Gardens, the Ellsworth Home Depot, Islandscaping Garden Center, J & P’s Farm Market, Sunflower Gardens and Greenhouses (with over 50 varieties of tomatoes), and Sweet Pea’s Farm all contribute greatly to the success of the plant sale. Simons Hancock Farm and Greenhouses recently discovered the Wild Gardens and we are wild about their donation of home-grown plants. The plant sale was originally held on the Bar Harbor green. But several decades ago, on one very wet sale day, St. Saviour’s Church opened its arms to the soggy plant worshipers and through the kindness of that sanctuary, that’s where the Wild Gardens plant sale has been held ever since. So be there, and be green: Saturday, June 10, from 9 am until noon, at St. Saviour’s Church, 41 Mt. Desert Street, Bar Harbor. Your garden will thank you. Each spring since 1961, the volunteers of the Wild Gardens of Acadia have held a benefit plant sale to support the maintenance of the Gardens. All proceeds help support the Wild Gardens of Acadia. Created and maintained by volunteers, the Wild Gardens of Acadia offer park visitors an award-winning microcosm of Acadia’s uniquely varied plant communities in a serene brookside setting. The Wild Gardens include over 400 plant species, all indigenous, in thirteen sections designed to represent natural plant communities found within Acadia National Park.